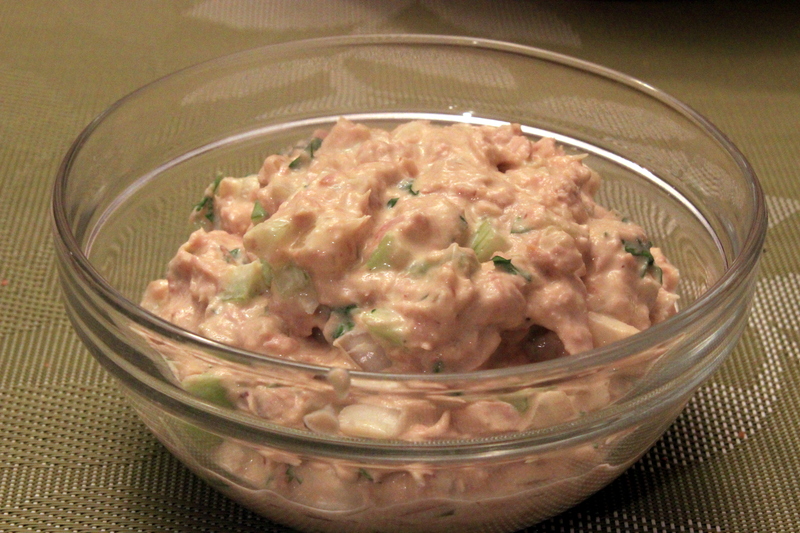 My favorite tuna salad recipe is with cottage cheese and I have posted it already. My kids went to a day camp last week and I had to pack lunch for them. I had tuna at home and wanted to make a nice tuna salad sandwich but didn’t have any cottage cheese. Looking for alternative, I found this recipe with mayonnaise and mustard on the foodnetwork. I’m not a big fan of mayonnaise and for this reason I only use it sporadically but this recipe uses no more than 3/4 cup of it and decided to give it a chance. I’m very happy with the result and decided to keep it. How to make: In a small bowl, combine the mayonnaise with the mustard. In a bigger bowl combine the chunks of drained tuna with the mayo-mustard mix, the celery, onion, parsley, pepper and lemon. You can serve immediately or put it in the refrigerator. Serving suggestions: Besides using the tuna salad to make sandwiches, I, also, use it to complement green salad, by adding a dollop on top.